We are what we eat. We have all heard that countless times, but to get down to the details, our heart also is what we eat, and it is a really important organ to feed well. I am going to share with you the top ten foods that the Cleveland Clinic and the American Dietetic Association say will promote heart health. We do not have to be confined to these ten. At the end of the list, I will give you a link to an even bigger list of foods as well as other menu suggestions that will treat your heart and your palate well. 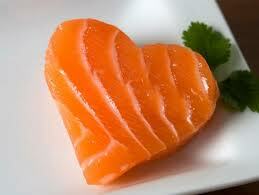 Salmon – As a meat, salmon is quite lean, but it also is rich in Omega-3 fatty acids which are really cardio-protective. You can make it even healthier by broiling it. Flaxseed (ground) – Also is full of Omega-3 fatty acids. It also has a lot of natural fiber which will be great for your heart as well as GI. It also contains phytoestrogens which help women to ward off breast cancer and osteoporosis. Oatmeal – Because we cannot get enough Omega-3 fatty acids, oatmeal is high on the list. In addition, it contains the important minerals magnesium, potassium, folate, niacin and calcium. The soluble fiber also is good for your GI. Black or Kidney Beans – These legumes bring important quantities of B-complex vitamins, niacin, folate, magnesium and calcium. They, too offer more omega-3 fatty acids and soluble fiber. Almonds – They make the list, because they also add omega-3 fatty acids, magnesium and fiber. To these, almonds also offer vitamin E, heart-favorable mono- and polyunsaturated fats and phytosterols, which help to block cholesterol absorption. Walnuts – They are right up there with almonds with omega-3 fatty acids, vitamin E, magnesium, fiber, heart-favorable mono- and polyunsaturated fats and phytosterols. To these they add folate. Red wine – Catechins and reservatrol (flavonoids) are antioxidants that not only take free radicals and metallic ions out of circulation, but they also enhance our moods – no, the alcohol does not get all the credit. Tuna – This fish does one better than salmon by adding to the Omega-3 fatty acids doses of folate and niacin. Tofu – Made from soy bean curd, tofu offer good quantities of niacin, folate, calcium, magnesium and potassium. Brown rice – In addition to the fiber, we also receive b-complex vitamins, niacin and magnesium from this grain. These are the top ten; for the rest of the list along with recipes, go to WebMD. Do You Sea a Hero in Yourself?